The Agroecology Criteria Tool (ACT) methodology is based on the analytical framework by Gliessman on the 5 levels of food system change and is embedded within the 10 Elements of Agroecology by FAO. Each element of the transition includes a list of relevant topics (inclusion criteria), which were based on past work by DeLonge et al. The methodology provides a structured and graphically intuitive way to identify the focus and agroecological character of an initiative. The tool has also been applied to the showcases compiled in this info pool. The methodology analyzes a continuum of a transition rather than a binary analysis and a clear definition. According to Gliessman's 5 levels, a system is in line with basic agroecological principles if Level 3 has been reached. Level 4 and 5 are going beyond production and focus on socio-economic aspects such as re-establishing connections between growers and eaters and responsible governance. The underlying interpretation of agroecology is a set of agricultural priciples by FAO focused on optimizing biological synergies and diversity in the agro-ecosystems and reducing negative trade-offs. Those farming systems should clearly identify and target key ecological functions and aim to integrate these various elements carefully into the farming systems creating multiple levels of positive interactions and not just substituting external inputs and engaging in isolated, singular interventions. 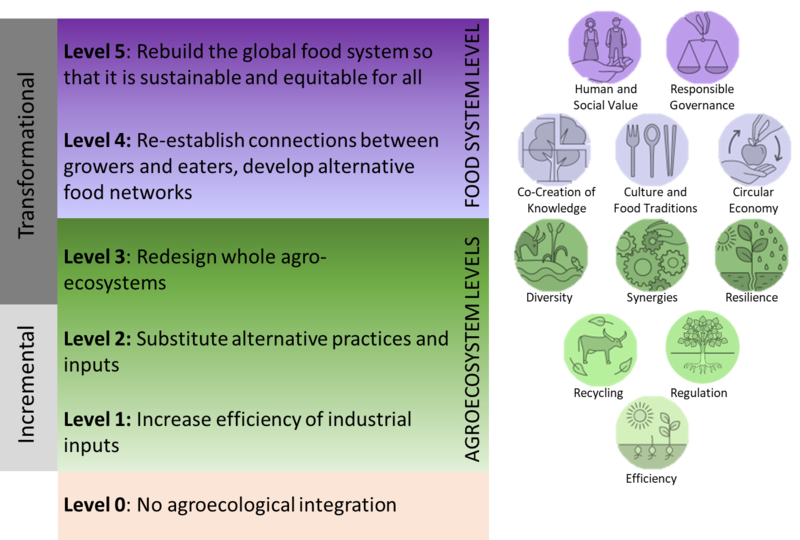 FAO (2018): “The 10 elements of Agroecology – Guiding the Transition to sustainable food and agricultural systems“. Rome, Italy. DeLonge, M. S., Miles, A., & Carlisle, L. (2016): “Investing in the transition to sustainable agriculture“. Environmental Science & Policy, 55, 266-273.